Gen Kelsang Tangpa is an American Buddhist monk and the Resident Teacher at the Mahamudra Kadampa Buddhist Center in Hermosa Beach and Santa Ana. Gen Tangpa has been a close disciple of Geshe Kelsang Gyatso for many years. 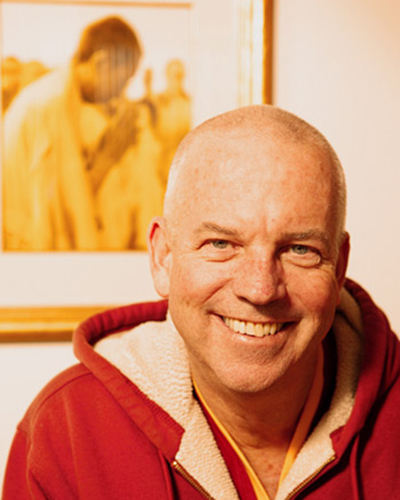 He is a fully ordained monk and he took his ordination vows with Geshe-la in Los Angeles in 2002. Gen Tangpa is known for his kind nature, dry humor, and clear insight. He is greatly admired for his powerful teachings and shows students how to solve their inner problems by example and make their lives more joyful and meaningful. Gen Tangpa teaches the walk-in General Program classes Monday through Wednesday nights in the South Bay, the General Program class Thursday nights in Orange County, the Foundation Program class Saturdays in Orange County and Foundation Program/Teacher Training Program Sundays in the South Bay.